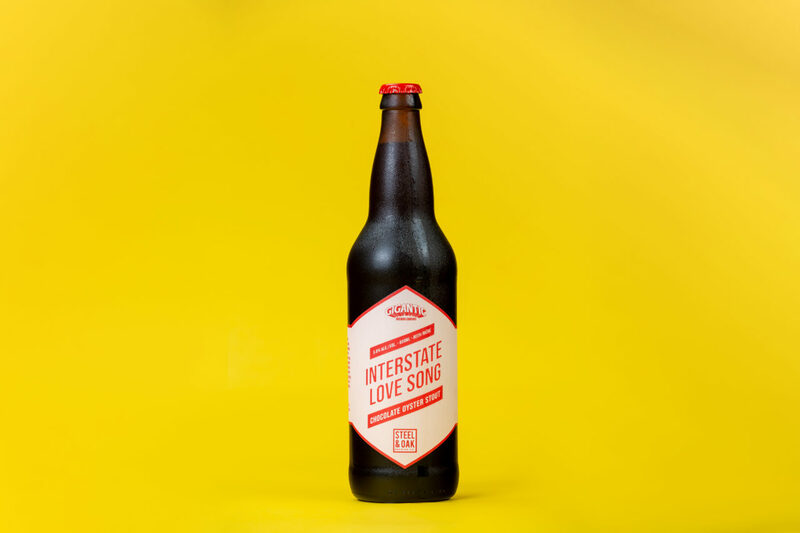 Interstate Love Song - Gigantic x S&O - Steel & Oak Brewing Co. So how does a brewery from Portland and a brewery from New West get together to make beer? Well Interstate Love Song (like many collabs) started over beers. I first hung out with Gigantic co-owner and Head Brewer Ben Love at Farmhouse Fest 2018. What started out as a friendly couple beers ended with us eating DL Chicken Shack sandwiches and trying not to get the hiccups. From that point forward, a friendship was formed. Our Head Brewer Eric went down to Portland for a thing and popped into Gigantic to chat with Ben. Ben thought it’d be cool and very BCish to brew something with oysters. Eric said “Oyster Pilsner!” (Eric wants to make everything into a Pilsner) Ben has a chocolate supplier that he loves called Woodblock and with the release being in winter it was agreed that a Chocolate Oyster Stout may be a safer way to go. Once back in BC we met with Scotty the Big Shucker who was fired up about the collab and recommended some oysters from Desolation Sound. It was rad having Ben and his wife Andrea up for the brew day and we would love any excuse to brew with Gigantic again! Interstate Love Song was originally going to be called Contains Shellfish. Buuuut I got a little pushback so we thought ISL was a creative name playing off of the Interstate that joins us, Love being Ben’s last name and the fact that this beer is made with some aphrodisiacs and will be launched Valentines Day, and finally, it’s a sweet Stone Temple Pilots song! If you had a look at our designer Sami’s S&O Instagram takeover you’ll actually be able to watch her design one of the versions of this label. The options I was sent are below and here are Sami’s explanations for each. “Option 1: Working with a retro comic book texture in the label to represent the Gigantic side of the design. I’ve kept it black and white to keep it feeling sort of grunge like the song. We decided to go with Option 1 but threw some colour at it. I think Sami did a great job of still keeping the font based vibe we use for S&O while adding a bit of that comic book feel that Gigantic is known for. We’re really excited about this beer and hope that you dig it too. Unless you’re allergic to shellfish, then don’t dig this beer at all please.